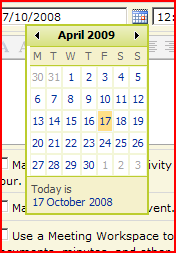 A while back I posted about the how daft that the datepicker control isn’t styled by themes, and is in the _layouts directory, so you shouldn’t edit them. Well, a while later Michelle posted with a good idea of how to brand them – use an alternate CSS URL. I must confess, this tip passed me by until my recent branding efforts, and I discovered her tip. There we go – code to insert the alternate CSS url (but not themes – obviously). … and, well, Team sites don’t give you that page.